Kuala Lumpur Kuala Rompin KL Sentral No 8, Terminal Kuala Rompin, 26800 Bandar Baru Rompin, Pahang. Kuala Lumpur Kuala Rompin Hotels in KL No 8, Terminal Kuala Rompin, 26800 Bandar Baru Rompin, Pahang. Kuala Lumpur Kuala Rompin Berjaya Times Square, Jln Imbi Bukit Bintang 55100 KL. (0192224773) No 8, Terminal Kuala Rompin, 26800 Bandar Baru Rompin, Pahang. Kuala Lumpur Kuala Rompin Terminal Bersepadu Selatan. TBS Counter A/D/E/F/G/H No 8, Terminal Kuala Rompin, 26800 Bandar Baru Rompin, Pahang. Bus from Kuala Lumpur to Kuala Rompin is the preferred mode of transportation service connecting Kuala Lumpur to Kuala Rompin. With the lack of flight and train services, bus service from Kuala Lumpur to Kuala Rompin becomes the only choice of public transport for commuters. This bus service is very important for the locals especially working adults and students who travel back and forth from the city to their hometown. Sanwa Express, Sepakat Liner Express and Transnasional are few bus companies offering bus service from Kuala Lumpur to Kuala Rompin. Their combined trips have up to 13 departures daily to Kuala Rompin from Kuala Lumpur, starting from 5:00am to 11:45pm. Among these operators, Transnasional is the largest operator in this route with a total of up to 6 daily departures. Both Transnasional and Sepakat Liner are operating the service with VIP coaches while Sanwa Express is serving the route with 40-seater standard coaches. The duration from Kuala Lumpur to Kuala Rompin takes about 5 hours depending on the road traffic condition. Washroom break will be given during the journey. All the buses deployed by Sanwa Express, Sepakat Liner Express and Transnasional are equipped with air-conditioners and reclining seats to ensure all the passengers can have a comfortable bus journey from Kuala Lumpur to Kuala Rompin. The bus fare from Kuala Lumpur to Kuala Rompin is from RM 31.60 to RM 38.30 depending on your choice of bus operator. The pick-up point in Kuala Lumpur is located at Terminal Bersepadu Selatan (TBS) while the drop off point in Kuala Rompin is located at Kuala Rompin Bus Terminal. 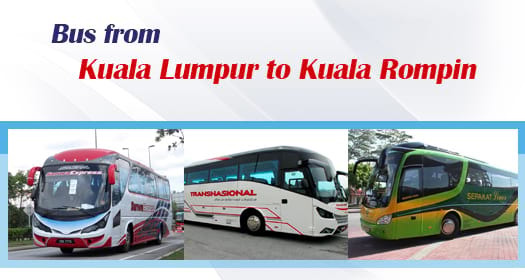 You can book bus from Kuala Lumpur to Kuala Rompin through the most reliable and secure online booking portal at BusOnlineTicket.com. You will receive instant confirmation upon successful payment. You can now enjoy a hassle-free bus ticket booking experience with BusOnlineTicket.com!